Byron Katie Event Video is Now Available! I find The Work not just profoundly inspiring but also straightforward and incredibly effective. An inevitable part of a child having special needs is that the parents, family members, friends, and caregivers are challenged to find ways to help the child. And often times, they experience fear, confusion, helplessness, and even guilt in this process. The Work is a remarkably effective way to shift beliefs and organize our relationships to our experience in ways that lift suffering and bring peace and greater joy in practically all circumstances. Byron Katie recently came to the ABM Center to present an afternoon session specifically for parents and caregivers of children with special needs. We videotaped this event and it is now available. This incredible two-hour session with Byron Katie is a small sample ofThe Work. For just $4.99, you can get access to the video of this event: Streaming Video of Byron Katie and Anat Baniel on the Special Needs Child. All proceeds from this video go to the ABM Foundation and The Work Foundation, Inc.
We invite you to check out our ABM Foundation website, mission, and the breakthrough outcomes that children with special needs have been getting with the Anat Baniel Method. For more information on Byron Katie, go to www.byronkatie.com. Many of you have already gotten access to this event and we would love to hear your feedback. Did you know that Amazon will contribute to the Anat Baniel Method Foundation? By simply shopping on the AmazonSmile website, and selecting the ABM Foundation as the charity of your choice, Amazon will donate 0.5% of the price of any of your eligible purchases to the Anat Baniel Method Foundation. You are not charged any extra fees to shop on this site. There is no cost to you or to the Anat Baniel Method Foundation. AmazonSmile is the same Amazon you know. Same products, same prices, same service. We appreciate your support of the Anat Baniel Method Foundation through the use of this special website: www.smile.amazon.com! You can click this link or the button below to go directly to the site, and the Anat Baniel Method Foundation will receive Amazon’s donation. We are excited to announce that Byron Katie is coming to the Anat Baniel Method Center in San Rafael, CA, on August 29, 2014. This event is recommended for parents, caregivers, professionals, family members of children with challenges, and anyone interested. Proceeds will go to The Work Foundation and the Anat Baniel Method Foundation. In working with children with special needs, I observed a missing link—attention to the parent’s experience. No one is prepared to have a child with challenges. Parents are flooded with fear, guilt, confusion, anger, loss, and often hopelessness. These feelings are to be expected and can lead to profound suffering. In Byron Katie, I found an exceptional teacher that helps people transform suffering into well-being. Katie has been bringing The Work to millions of people for more than 25 years and has brought freedom to people all over the world. Byron Katie’s six books include the bestselling Loving What Is, I Need Your Love—Is That True? and A Thousand Names for Joy. For more information, visit www.thework.com. Loving What Is—The Work can free parents, caregivers, family members, and professionals to love and help their child in even more powerful ways. Everyone is welcome. Get the Byron Katie Benefit flyer for printing here. Get the Byron Katie Benefit flyer for emailing here (there are direct links in the pdf). I hope you can join us for this very special opportunity to study with Byron Katie and learn how to transform suffering and confusion into freedom and well-being. Welcome to the Anat Baniel Method Foundation (ABMF) website and blog! Whether you are a parent or family member of a child with special needs, a practitioner in search of a leading edge method to help a patient, or you are simply interested in exploring alternative treatments, you are welcome here. 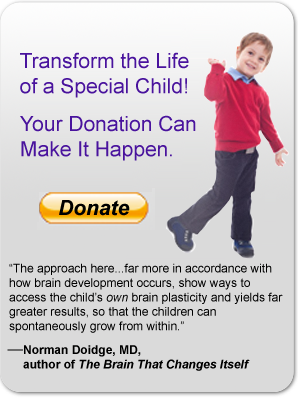 We are eager to share with the wider world our knowledge of the remarkable capacity of the human brain to change itself – to help transform the lives of children with special healthcare needs and diagnosed developmental challenges. In this blog, we will share the latest findings, inspiring success stories, and food for thought. From time to time, we will invite guest contributors to the blog to contribute their unique experiences and perspectives on issues that matter most to you. We also hope to share quotes and thoughts from Anat Baniel herself here on the blog. Have ideas or want to contribute? Please send us an email at staff@abmfoundation.org.